The Samsung Galaxy S9 has been launched by the company with some smart upgrades. 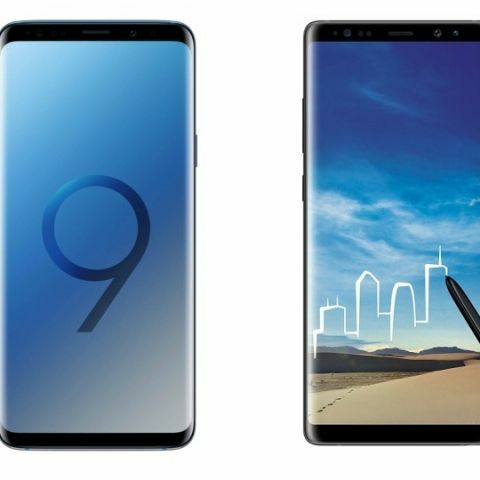 However, despite being the company’s one of the most recent flagship device, it is not very easy to choose between the Note 8 and Galaxy S9. The Samsung Galaxy S9 has come up with a few essential improvements over the Galaxy Note 8 but still shares almost the same hardware. The company's latest device Galaxy S9 looks exactly the same as its predecessor the Galaxy S8. 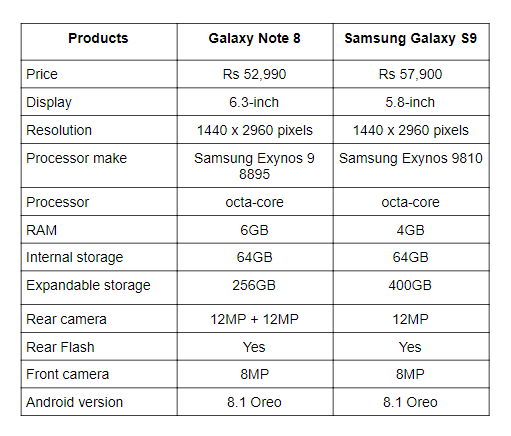 However, there are some noticeable changes and features added by the Samsung, which is considerable at least. The company adds the new device in its flagship smartphone lineups every year twice. So, it would be interesting to see whether the upgrade worths spending money or should you stick up with your current device “Galaxy Note 8”? The Samsung Galaxy Note 8 sports a bigger 6.3-inch Quad HD+ display that offers a resolution of 1440 x 2960 pixels. On the other hand, the Samsung Galaxy S9 sports a smaller 5.8-inch display that offers the same resolution as the Galaxy Note 8. If you’re looking for a smartphone with a big screen then the Note 8 might be the right device for you. However, you should keep in mind that both smartphones panel offer the same resolutions. The Samsung Galaxy Note 8 is powered by an Exynos 8895 octa-core processor, which is coupled with 6GB RAM and 64GB internal memory. On the other hand, the Samsung Galaxy S9 is backed by the faster Exynos 9810 octa-core processor. The phone is available in three storage models - 4GB/64GB, 4GB/128GB, and 4GB/256GB. The internal storage of both devices is also expandable via a microSD card. The Samsung Galaxy Note 8 features a dual 12MP rear cameras with an 8MP unit on the front. On the other hand, the Samsung Galaxy S9 features a 12MP “dual aperture” rear camera that helps in producing better images in low light conditions. It also comes with a Pro mode that lets you do the camera settings manually. At the front, it has an 8MP unit. As I mentioned earlier as well, the Samsung Galaxy S9 has been launched with some improvements that are worth taking into consideration but at the same time not so major. As per me, One of the major upgrades in the Galaxy S9 has been made in its rear camera, which comes with a dual aperture 12MP sensor. Samsung has also finally placed its fingerprint sensor below the rear camera, which was much needed. Although, the Note 8 is not so far behind as it also has a dual 12MP rear cameras and most importantly the “S” Pen, which makes this phone completely different from the Galaxy S9. The Galaxy S9 is available in India for Rs 57,900, while you can get the Galaxy Note 8 for Rs 52,990 on Amazon. which is better and why is it better?